An all-new design brings a welcomed exterior update to the crossover, along with an interior modeled after the Cherokee. A total of 17 powertrain options will be selectively available to the 100-plus global markets Jeep is selling to. Here in the U.S., however, the Compass is solely powered by a revised version of FCA’s 2.4-liter Tigershark turbo-four. 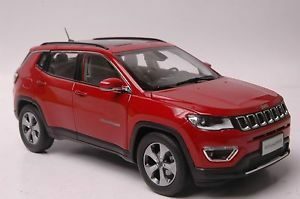 Two automatics and a manual transmission are available, as is front-wheel drive and two versions of Jeep’s Active Drive 4WD system.The Compass will come in Jeep’s wide range of trim levels, including the base Sport, the mid-grade Latitude, the luxury-minded Limited, and the off-road ready Trailhawk. This will mark the first time the Trailhawk trim will be offered on the Compass, telling of the Compass’ improved off-road prowess. Buyers of premium soft-roaders do tend to care about the way their ride looks which means the Compass ought to look good. It is, in fact, instantly recognizable as a Jeep with its traditional design cues like the seven-slot grille, squared wheel arches and lots of clearance. The Compass’ mimics some of the Cherokee’s design bits like the clamshell hood with a dual break line and centre bulge besides the sleek pair of headlights. At the rear, the standout feature comes in the form of its LED taillights. Slim and rectangular in shape, the lamp design flows into the tailgate which heightens the sense of width. The other design highlight is the chrome strip that runs over the window line and flows around the car, differentiating the contrasting roof from the rest of the sheet metal.All in all, the seven-slot grille, that bulging bonnet and the high stance have some real presence, giving the Compass a charming veneer to an otherwise straightforward albeit a well-proportioned design. The interiors of the JeepCompass aren’t very swanky and lavish. The dashboard is simple yet functional having a dual tone treatment. You’ve got a chunky three-spoke steering wheel with audio controls but there are some dummy buttons for the cruise control, which is not being offered in India. The instrument cluster looks premium having a huge MID in the middle and is easy to read. There is a neatly integrated touchscreen infotainment system. The user interface looks good but the touch quality is just average. Jeep offers Apple CarPlay and Android Auto for smartphone connectivity. The sound quality of the audio system is rich and quite satisfying. Some of the features missing in the Compass are sunroof, electrically adjustable seats, auto headlamps, auto wipers, etc. The 2017 Jeep Compass might be all-new, but its powertrain is familiar. Thankfully familiar doesn’t mean carryover, as the 2.4-liter Tigershark four-cylinder turbo enjoys a nice upgrade. The engine now features FCA’s MultiAir2 valvetrain technology with four valves per cylinder operated by an electro-hydraulically controlled variable valve timing system. The result is eight more horsepower and 10 more pound-feet of torque than before, totaling 180 horsepower and 175 pound-feet of torque. Three transmission choices are available. The Compass comes standard with a six-speed manual transmission. It can be paired with either FWD or 4WD drivetrain systems. The manual has a 6.68 ratio spread and a 4.438 final-drive ratio. A low 18.4:1 first gear is designed to help with fast acceleration and good low-speed torque delivery. Next, a six-speed Aisin automatic is optional for FWD models. It has a 6.635 ratio spread and a 3.502 final-drive ratio. On higher trim levels, FCA’s nine-speed automatic transmission can be had on 4WD models. The EPA has rated this 4WD version with the nine-speed automatic at 22 mpg city, 30 mpg highway, and 25 mpg combined. Future testing will likely soon announced fuel economy estimates of the FWD versions with both six-speed gearbox options. Ride comfort in particular is its forte, with it being far more composed and absorbing than the fussy Tucson. The Jeep irons out small bumps and ruts remarkably well and while it isn’t as planted as the VW Tiguan at highway speeds, it’s never unsettled. We believe some of that absorbency is down to its Firestone all-weather tyres that, despite being an unknown name in India, offer good traction and compliance. While obviously it’s no high performance car, the Compass feels balanced through the corners and sits flatter than what was expected. The updates Jeep has brought to the Compass have done wonders to its appearance and we’re betting its performance and drivability will also boast remarkable improvements. The Compass’ new appearance is far more mature and handsome. Gone is its mismatched angles and oddly-shaped D-pillar – all replaced with a baby Grand Cherokee styling language that pushed the envelope for the segment. Inside, the story is the same thanks to a well-designed instrument panel that’s filled with the latest technology and convenience features. Top that off with an available Trailhawk trim package that pushes the Compass far past any of its competitors in terms of off-road performance.